Send fond wishes with this special bouquet of soft and feminine flowers all wrapped up in one pretty package. A thoughtful choice for any occasion, the bouquet charms with its delightful mix of pastel flowers such as spray roses, alstroemeria, and miniature carnations. 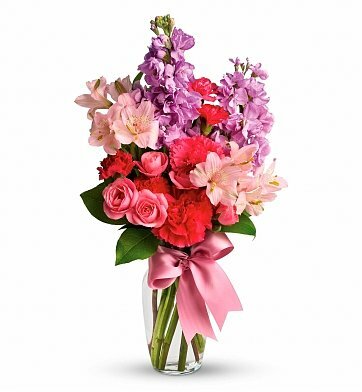 The fresh blooms are delivered in a classic glass vase finished with a hand-tied bow. Simply lovely. Measures approximately 10" x 17". Fond Wishes Bouquet is a hand delivered gift. These gifts are delivered by one of our local design centers located throughout the United States and Canada. Same day delivery is available for most gifts when ordered before the cutoff time. The cutoff time for Fond Wishes Bouquet is 2 PM in the recipient's time zone. I didn't see the arrangement in person but my friend said they were lovely. The flowers were not only beautiful but the smell was amazing!!!! They were amazing!!!! I will definitely send them again!!!! Delivered fast, within a few hours of ordering, and accurately. Flowers looked great too. The flowers were beautiful and well arranged. The ability to get them delivered same day and on time so she would get them was most impressive. Great service. The flowers were gorgeous and my mom was thrilled. They had some trouble finding the house (because I accidentally gave them the wrong address!! ), but they called me and were very courteous about it. Overall, I was pleased. Made it to the desired delivery place no problem, on the day it was supposed to be there. Not sure how the presentation or anything was, but it wasn't bad! Ordered 2 weeks before delivery date. Roses within were pink and lavender and the person receiving this bouquet was "blown away".